If you have decided to homeschool and you have a young child, you might be wondering how to homeschool preschool. You might be feeling a sense of overwhelm and confusion as you look for options and information. Preschool doesn’t have to be complicated. You don’t need a full curriculum to be successful just having fun with your kids. At the very basic root, a good preschool experience includes the following: reading lots of books together, spending time outside in nature, playing with other kids, having access to art supplies, helping with housework chores and cooking, and trying new things. Hopefully, this post will help give you some confidence and ideas of how to learn with your little one in these early years. 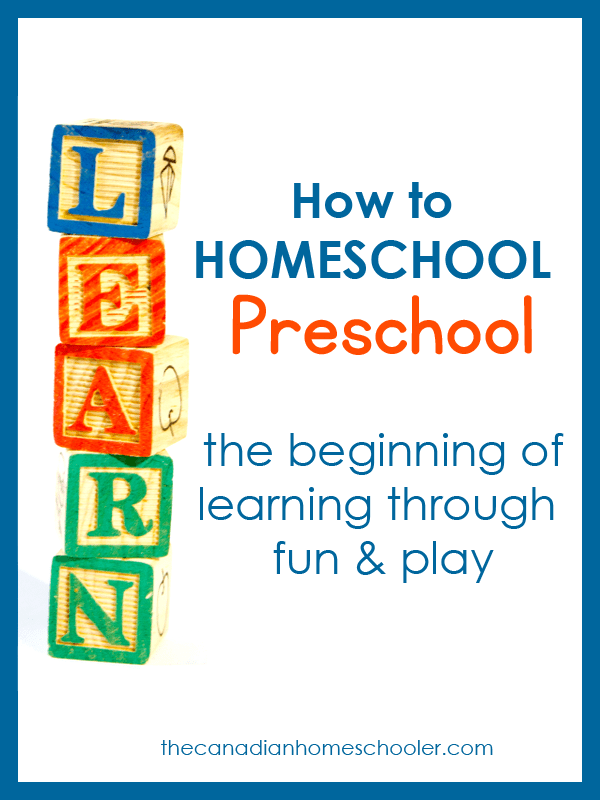 How to Homeschool Preschool: Play is the Key. Learning through play is the single most important thing in an early childhood education. Formal learning isn’t really needed for a child who is 3 or 4. (I’m tempted to say even higher than that, actually. Like… until they are 7+. And even then…. but I digress.) Creating opportunities for your child to learn through play is really a vital key to their development. But what does this look like? How can play be learning and how can you implement it in your home? Play-based learning is just that. Watch your little one for a single day as they putter around, exploring their world, and interacting with things or people. Every moment is a learning experience or opportunity. When they build towers with blocks, they are discovering attributes of shapes (rectangles have long sides so you can stack things on top of them, but if you put a cylinder on its side, it rolls away). When they build it too high, they learn that things fall over because they get too unstable. When they play on the playground, they learn that slides are hard to climb but stairs make it easy to get up. When they talk to other kids, they have to learn how to communicate effectively, how to share, how to take turns, etc. 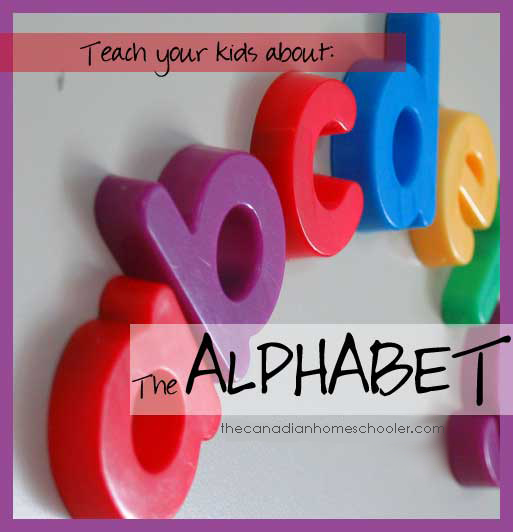 When they play with magnet letters, they are learning to recognize the alphabet and the difference between upper and lower case. As a parent, you just need to offer them the tools to play and the space to explore. This doesn’t have to be expensive. It can be as simple as a magnifying glass and a bin of leaves. Or a stick, sand, and water. But it can also be a bin of LEGO pieces, a simple game like memory, or a collection of musical instruments. Play-based learning can be intentional too. You can create simple resources or opportunities to learn. One of my personal favourites for the little guys is something we call “noodle math.” You give your child a pile of noodles and on a piece of paper, draw some circles. Write a number in each circle and ask your child to put the right amount of noodles in each circle. It’s a game they love to play. You can create file folder games or busy bags which allow kids to explore a single skill on their own. You can write letters on index cards and lay them out all over the floor and hop around on them, yelling the letters as they land on a card. The thought here is to create play-centred activities that allow your child to learn something, whether intentionally or incidentally. When learning is fun, kids retain more, understand more, and want to know more. For example, let’s say your theme is The Very Hungry Caterpillar by Eric Carle. Here are some ways to connect your learning to that story. These early years aren’t about forcing your child to learn how to read or they will be behind. It’s about creating a foundation of learning. If you set your 3 or 4-year-old down with a workbook and expect them to finish a page of math, you run the risk of creating an association between school and boredom or frustration. That’s not going to encourage them to want to do school at any point. Once you’ve killed their natural interest in learning, it can be incredibly hard to get it back. Does this mean that you should never allow your child a workbook or intentional academics? No. For your little ones, having some simple workbooks available can be fun. You can even encourage them to try it out, or let them tell you they want to use them. But don’t FORCE them to do it. Make it casual, fun, and interesting. Let them decide when they are done or even what pages they want to work on. Kids love computers and games. Use that to your advantage and provide some learning opportunities through the digital medium. Starfall – This website (and app) has both a free and a membership section. The free section includes some really quality language resources – starting with letters and sounds and moving to more difficult skills like putting sounds together to make words and eventually even stories. There are also some interactive activities (like building a gingerbread man, adding faces to pumpkins, etc) and games. Membership content is more in depth, adding in math and higher level learning resources. The animations on this site are fun and little kids really enjoy the bright colours combined with silliness. This site is a great way to teach mouse skills as well, because whenever something needs to be clicked, it sparkles. There are also printables you can download and books you can buy. ABCmouse.com – This site includes games, puzzles, online books, and more for math, language, art, and science through 10 levels that cover preschool to 2nd grade. Your child has a classroom to explore and throughout the program earn tickets they can use to buy new things to decorate their room. It’s available on a website and as an app as well. Printables you can use offline are available. It is a very comprehensive program with lots of activities and fun. Teach Your Monster To Read – This program is from the Usborne Foundation (the people who publish Usborne Books). Your child has their own monster and you have to do these mini-games to earn prizes and gear and such. These games focus on phonics and words, progressively getting more challenging the farther along you get. It’s available as a website and also as an app. ABCya.com – This site has games for kids from Pre-K right through Grade 5, all carefully sectioned by level and by subject. There are lots of options of games to play. Reading Eggs / MathSeeds – This site has two sections: one for reading and one for math. On both sections, your child has a character that they use to navigate through a map. Each stop on the map involves a series of games and activities to develop their math or number skills. There are many maps and levels, allowing your child to continue to work through the game until they are much older. They get to buy things for their character with rewards that they earn for completing activities. 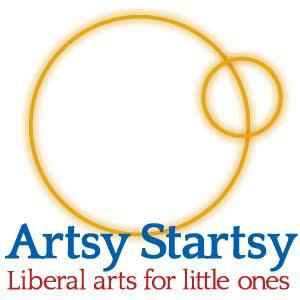 Artsy Startsy – This program uses arts as a base, encouraging your early learner to ROAM (Reader, Observer, Artist, Musician). There are 8 weeks of lessons per season (with a bonus 2 weeks for summer), where each week you and your child read some recommended books, discover different artists and their styles, learn about composers and musical instruments, and explore nature. Five in a Row / Come Sit By Me – These programs both use children’s picture books as their theme. Basically, for a week, you read a central book and do activities that connect with it. These are two different resources that share a common theme. Come Sit By Me is Canadian and focuses on Canadian picture books, where Five in a Row uses all sorts of stories. Letter of the Week – This website creates a foundation of reading skills, starting with letters and moving to sounds and stories as your child gets older. It includes a recommended weekly schedule with activities that re-enforce the letter or sound of the week. Easy Peasy Homeschool – This program focuses on letters and early reading skills for the preschool level. God’s Little Explorers – Using Bible stories that tie into letters of the week, this 28-week curriculum pulls in activities like cooking, crafts, life skills, busy bags, books, language, and more. There is a free and a paid version available. Go to the Library. Not only can you get access to a plethora of interesting and fun reading materials, but libraries typically also offer programs for all ages – look for what kinds of activities they run. I’ve seen preschool story time, LEGO club, Make & Take craft days, and even Science exploring. Go to the Playground. Any playground. Then let them run wild. Kids will more often than not gravitate to other kids to share their most important details like “I’m 4.” instead of their names. Then they play like they are best friends until parents drag them away. This is free, fun, and full of exercise while offering plenty of opportunities to connect with kids of all ages. Go to a Senior’s Care Centre. Elderly people love little kids. It can be a total bright spot in an otherwise quiet day. See if there is a nursing home or community centre near you that offer times for visitors with children to come and hang out. Find Free / Cheap Activities in the Community. Did you know that Home Depot offers a kids’ workshop one Saturday morning a month where your child can make a woodworking kit project for free? Some art galleries have free family art days where you can go and art you heart out. Check the community listings – sometimes cities have events like history days, concerts, or fairs that you can take your kids too. There are farmers’ markets that you can visit too. Look for homeschool groups near you. Lots of times homeschoolers have community groups that you can join in for field trips, playdates, and other activities. It’s worth connecting with other homeschooling families so you can grow together and create a network of fun and friends. The Most Important Thing? This is not a race. While yes, there are some little learners who pick up reading faster than other kids or are excellent in math or other areas of academics – this isn’t a race. Your goal isn’t to get your preschooler in first place. It’s to enjoy the time together and to help nurture a life of curious and passionate learning. It’s about appreciating the wonder of childhood innocence while you can. They don’t have to be reading by the time they are 6 – you won’t be setting them up for failure. That’s all that you REALLY need to do to homeschool preschool. Very well said at the end. It is not a race. We should let our children’s to be free and enjoy what hey are doing in their preschool.